Brazil has always been on our hearts as a couple, and God’s prompting and direction has led us there twice. We are awaiting his call for our next trip. My name is Bernice Sagala, and I am married to Sua Sagala. We are in awe of how God’s plan unfolds day by day, and how his grace continues to keep us grounded in Him. We had never dreamed that we would go to Brazil on missions 5 years ago, but God’s plans are far greater than what we could ever hope or imagine. We love stepping into the unknown for the Lord, knowing that he causes things to happen, and has a bigger vision for us. We had billeted 2 lots of missionaries from YWAM Recife Brazil in 2013-14 whom we got to know and gain an understanding on their culture, language, food, and beliefs etc. God stirred us up to go on missions to step out in faith in obedience, so that’s what we did – we took time off from our jobs, paid our fares, got a team together, and with the support of our church family, leadership and awesome Pastors Lui and Ane Ponifasio it became a reality. Some people are called to be “goers”, some are called to be “senders” and others are called to be “cheerleaders”. God had orchestrated these Missions trips to take place, along with many others. We liased with the amazing leaders of the YWAM base in Recife Brazil; Mati and Julie Gali. Because we had a team of missionaries from NZ that we were fortunate to travel with, we could share the responsibilities around on the mission field. Lady living in the favelas: We were shown around by a man called Fernando who was one of the leaders for the outreach ministry. He visits families in favelas which are the poorer families in Recife. We were led to a family of 5 children with 3 adults. Their mother sold handmade jewellery and used different things to make a living. They were a very poor family, but she and her partner really encouraged their children to go to school, and tried to make ends meet with what little they had. She told us that their house was burnt down, so that’s why they built this temporary shack for the time being to house their family. It was above a mirky river, which had sewage and other types of pollution drifting down it. They said they often saw dead animals and a couple of times people drifting through. All types of smells around this area too. This lady gifted myself and Leia with a bracelet each which meant a lot to us, because she had a giving heart and God was ministering to her as well. She said she had a dream that some missionaries will come and visit her and her family, and that will be a sign that God will take care of them. That was a heart moving moment and we praised and gave Him the glory and honour. Adrienne with throat cancer: As our time in Brazil was coming closer to the end, Adrienne in his mid-thirties and wife Eni and baby walked over to the house we were staying in at the time. His frail body, and mask that he was wearing indicated that he was unwell. His faith had brought him to us. He was diagnosed just 5 months ago with throat cancer, and going through chemotherapy at the time. His wife in desperation, and wanted us to lay hands on him and pray. 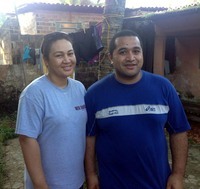 They had faith, and were wanting to ask us as missionaries to worship together with them. We sang worship songs together, and we stood together with them believing God for his healing. Pastors Lui and Pati shared biblical encouragements with them, and then we all laid hands on them. They were in tears, and so were we. The holy spirit was moving in a special way at the moment, and God had used us to encourage this family, but more so, Adrienne with his throat cancer. These along with many other stories on missions have inspired us to be doers of the Word and not just hearers of the Word. We pray for long term opportunities where we can serve in the mission fields. We hope God will stir you up to go on missions to fulfil the great commission. Amen. © 2019 Pacific 2 Nations. All rights reserved.